This is Sam, adopted by Cynthia, who writes, "He's doing great - thriving! He's unflappable in the midst of my house renovations." 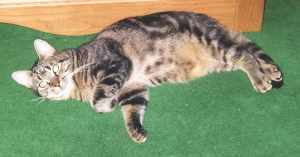 Tiki was adopted in February 1999 by Cindy and John, who write, "He was a challenge, and took quite a while to come around - not to mention a great deal of love and attention! It was well worth the wait, though, and now Tiki is an irreplaceable member of our family." Mac (left) and Leno (right) were adopted in October 1999 by Althea and Charlie, who wote us with this update in 2007, "We have enjoyed their company for many years now. 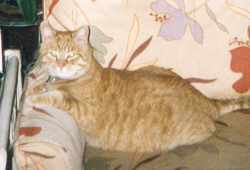 During that time we have welcomed one new cat into our household, as well as fostering several cats that eventually found homes elsewhere and caring for feral cats that have come to our back door in search of food and assistance." "I am sorry to say that Leno has passed away. He had not enjoyed good health for many years, but continued to be always affectionate and loving, no matter how poorly he felt. 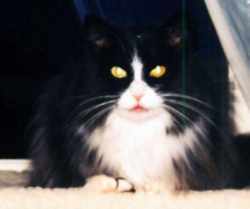 Leno was perhaps the friendliest cat we ever had -- he never met a stranger he didn't like! "When we came to Kitty Angels, because we had seen Mac's photo on your website, we were asked to take Leno also, because the two cats had "bonded." 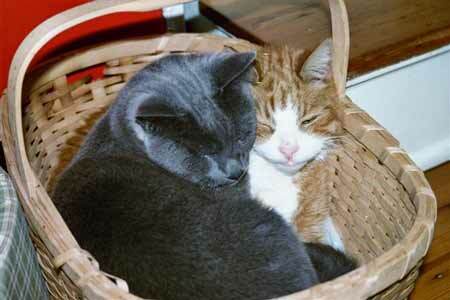 We thought that was just your way of finding a home for two cats rather than one. But it was so true -- Mac and Leno were the best of buddies. We all miss Leno very much!" Spunky was adopted in January 1999 by Alexis and David and has now taken charge of their whole house. Her favorite place to watch the world go by is in front of the living room sliding glass doors and her favorite place to sleep is in her window hammock. Spunky has Feline Leukemia but is very healthy and with her "spunky attitude" will no doubt live a long time!